Mexican singer and songwriter Natalia Lafourcade performs a sold-out show May 11 at the Pharr Events Center, where she said farewell to fans as she prepares to take a break. 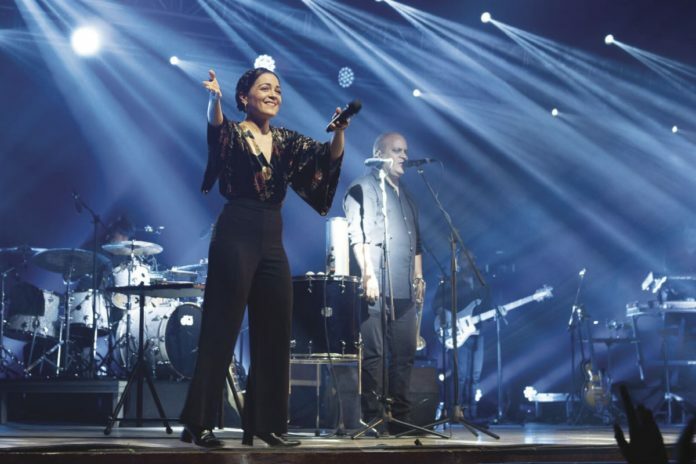 With a sweet serenade that she composed for a friend as they parted ways, Natalia Lafourcade said goodbye to the more than 2,200 attendees who accompanied her at the Pharr Events Center on May 11. But this, her first time in the Rio Grande Valley, would be special as she announced she will take a break after this tour and doesn’t know when she’ll step foot on a stage again. LaFourcade told the crowd it was a dream come true to travel through the United States with this kind of tour. And after witnessing the folkloric setlist that the 34-year-old Veracruzana created for her fans, it’s easy to assume that by “this kind of tour,” she meant a tour that paints the air with the bright, beautiful colors that is the Mexican and Latin American culture. Her latest albums “Musas Volumes one and two,” both carry the subtitle “An Homage to Latin American Folklore at the Hands of Los Macorinos.” Her performance reflected just that, even as Los Macorinos, a Mexican guitar duo, didn’t accompany her in the tour. LaFourcade started and finished her sold out show with solo performances to the sound of her guitar. She set the tone of what was to come with the first song, “La Llorona,” (The Crying Woman) a classic Mexican folk song believed to have been composed somewhere around the Mexican revolution of 1910, and later interpreted by artists of the caliber of the country’s icon Chavela Vargas, a Costa Rican but Mexican-at-heart singer known for her rendition of Rancheras. LaFourcade followed with one of her originals, “Mexicana Hermosa” (Beautiful Mexican), dedicated to Mexico City, asking her beautiful city not to be strong and not sad. And afterward, her band joined her onstage to kick off the celebration. Lafourcade took the audience through her own artistic evolution, from hits that made millions sing when she was only a teenager with Natalia y La Forquetina, to her solo career. Last week, she performed her repertoire with an air of maturity that wasn’t present during some of her experimental years. From songs such as “En el 2000” (In the year 2000) which launched her career in 2002, making teenagers, like myself at the time, memorize every word and guitar chord, to “Casa” (Home) taking us through her Rock Band phase full of memorable songs. And who can forget “Ella es bonita” (She is pretty) included in a solo album when one could see her on stage looping melodies to accompany her voice. But very appropriately so, she was growing with the rest of us. Last Friday, she performed as a mature woman reminiscing of her eclectic trajectory and whose music found a greater purpose in representing the beautiful culture that tends to get lost in today’s political climate. However long it takes her to come back to the spotlight, the young icon left her fans strong material to carry them through her absence. And her passionate performance suggests she hasn’t lost an ounce of love for her craft.